Ford has launched the facelifted 2018 Ford Aspire today. The car will be offered in both diesel and petrol variants as its predecessor. The diesel motor continues to be the same as on the old car while the petrol variants get two options, an all-new 1.2L motor with a manual transmission and a 1.5L motor with an automatic transmission. The updated Aspire is priced between Rs. 5.55 Lakh for the base 1.2L petrol variant and goes up to Rs. 8.49 lakh for the 1.5L Automatic petrol variant. The car will be available in 5 trim levels and will be offered in seven colours. The front grille gets an all-new three-dimensional design, surrounded in chrome and feature shiny bead-like pattern. The front bumper is also new and features new fog lamps with chrome semi-surrounds. Headlights now feature a blackened look. The tail lights are redesigned as well. The car will now feature a set of newly designed 15-inch alloy wheels. 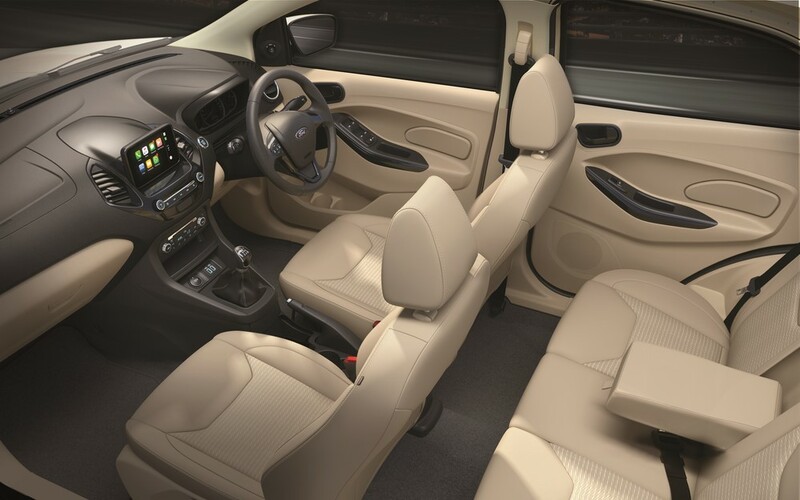 The interiors on the new Aspire comes in a beige colour theme. The car will now feature an all-new 6.5-inch coloured touch screen Sync 3 infotainment system with Android Auto and Apple Car Play. Additionally, the car will also come with features like a reverse parking camera, automatic climate control, two USB slots in front, push-button start, rain-sensing wipers, auto headlamps, among others. The new Aspire will come with dual airbags as standard across the range while the top end Titanium+ variant will get six airbags. ABS+EBD and ESP are also on offer. 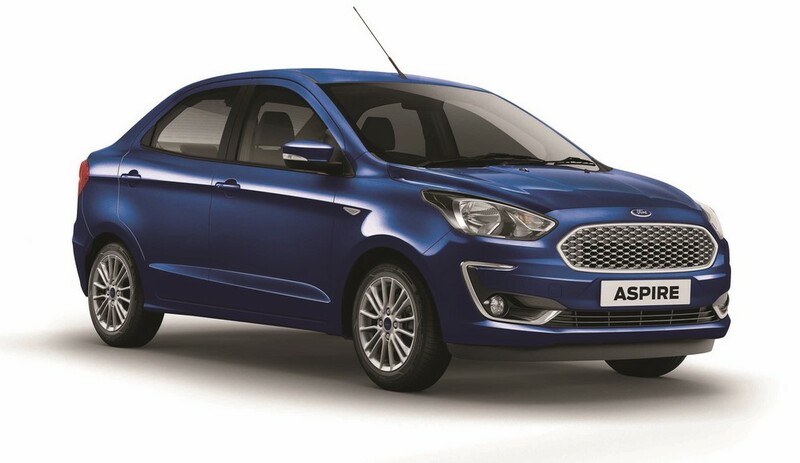 As mentioned earlier, the 2018 Ford Aspire comes with one diesel and two petrol engine options. The diesel motor is the same 1.5L TDCi one carried forward from the current car. It produces 100PS power and 215Nm torque. It boasts of a 26.1 KM/L company claimed mileage figure. This engine will come mated to an all-new 5 speed MT box. The first petrol engine on offer is an all-new 3 cylinder, 1.2L TiVCT producing 96PS power and 120Nm torque. It comes mated to the same 5 speed MT as the diesel model. The second petrol motor will only be offered in the automatic variant and is a 1.5L 3 cylinder mill producing 123PS of power. This will come mated to a 6-speed torque converter automatic box and will be available only in the Titanium trim. 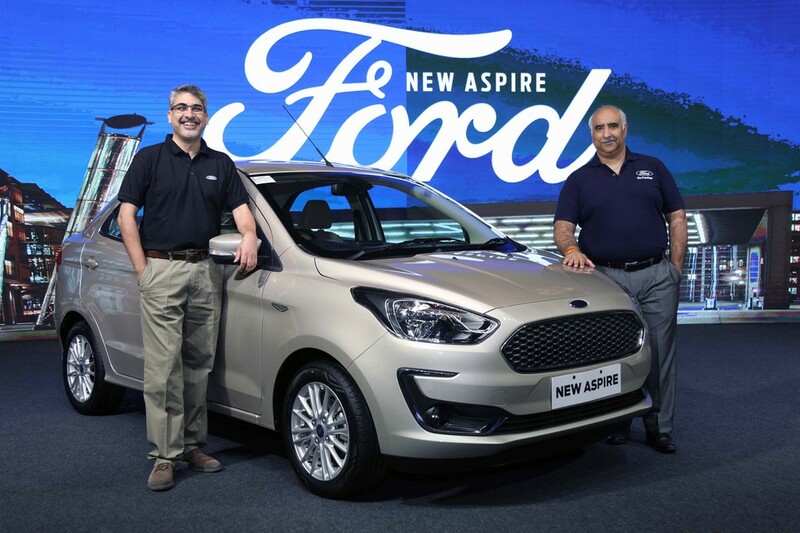 Ford has equipped the car very well and has given it terrific engine & transmission options. Not just this, the car has also been priced fantastically. Now, we need to see how will it perform against its arch rivals like the Maruti Suzuki Dzire, Tata Tigor, Hyundai Xcent and VW Ameo.